I’m normally one to steer well clear of iOS and mobile based games. I always jump to the worst possible conclusion about them, that they just exist to exploit people into giving them more money and time than they really should. It’s silly really considering it is a free game but I still avoid these types of games anyway out of habit. There has been one exception to this rule, and that was a game called Crossy Road. Dubbed an endless frogger by many critics, the game, made by a small development group by the name of Hipster Whale, drew me in with its simplicity and the fact that I was playing the same game on day 30 as I was on day one. It was a simple game where you played a chicken that crossed a never ending series of roads and streams. The game gave further incentive by providing coins that could be used to spin a slot machine and unlock new characters, some of which had cute visual quirks, and others that changed the visual style of the game completely. However, none of them had any effect on the game itself. It was fun and I played it until beating my old top score became more than a toilet job. Hipster Whale have moved onto bigger things though, teaming up with Bandi Namco and reeling Pac-Man 256 on iOS. Named for the infamous glitch on stage 256 of the original Pac-Man, the player most navigate a randomly generating maze, all while avoiding ghosts, eating a much as possible and outrunning the infamous kill screen that looms behind the player. 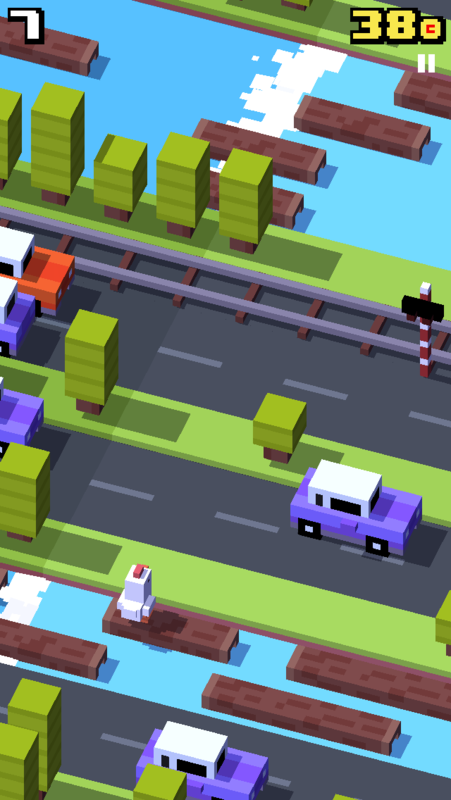 It’s fun and feels very much like Crossy Road in many ways. It does, however, contain some more of the free to play business practices that I find distasteful in these types of games. Rather than skins, the player unlocks power-ups, which you can use three of at any time. These show up throughout the level as items and ease your continued progress and build on your score. To have these power-ups show up in a stage, you need to start a level while spending a token, you can also spend a token to continue playing once after the first death on a stage. These tokens recharge quick enough, but at the same time, they limit the amount you can play effectively if you do care about beating the high scores on your friends list. That, however, is my problem and doesn’t affect the basic game itself, which is still fun. 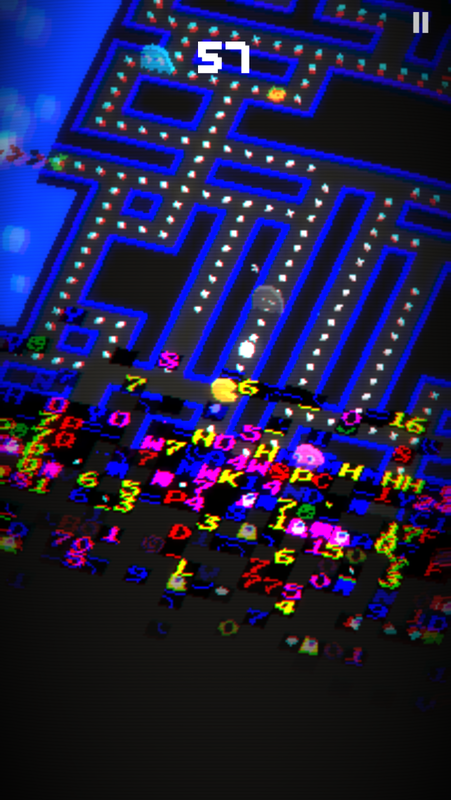 It has reminded me of one thing though; and that is that I am really not very good at Pac-Man. I’ve always played the game the same way, a mad rush to eat all the pellets on the stage as quickly as possible, and to not necessarily to gain score or play strategically. It’s not like I didn’t know there was strategy to the game, I’ve known that the ghosts have each had their own behaviours for a while, but I never looked into it any deeper than that. Pinky, also known as Speedy, was named Ambusher, a ghost whose main tactic is to try and go to where Pac-Man is going to be and get the jump on him. This tactic becomes much more obvious in 256 where Pinky simply sits still till the player moves into his line of sight, then he makes a beeline toward the player unless they make a turn. The behaviour of the ghosts has become easily gained knowledge since, and thus makes the playing of 256 something seasoned Pac-Man players may have an easier time with. However, 256 mixed things up by adding another four ghosts on top of the ones we all recognise. Spunky, Funky, Glitchy and Sue all join the cast of chasers. Sue and Funky both appear in horizontal lines, Funky will just bop back and forth between the walls, but Sue will track players and if they stay in a single lane for long enough they may find their path blocked by a line of purple ghosts. Spunky works like Pinky, sleeping until the player gets within a certain proximity of him. He will then wake up and sluggishly chase the player before falling asleep again to repeat the process if the player gets close enough again. Glitchy is the most unpredictable, having the same glitch effect as the wall of death behind the player. He will appear somewhere on the map and then exhibit a random trait of one of the other ghosts. It puts a lot on the plate of the player, keeping track of all seven of the ghost types not only to avoid them, but also to avoid getting caught out by Glitchy. Knowing these tactics can become the key to being any kind of successful at this game, not only that, you need to internalise the ghosts to the point where you know the threat they pose all while picking your route and outrunning the glitch. It’s actually more daunting to me now than it was before I started looking into learning Pac-Man. 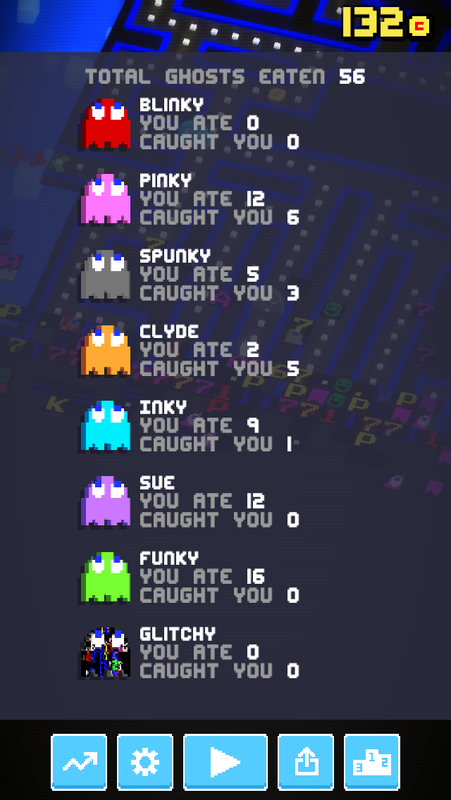 I’ve learned a fair bit about the original Pac-Man since playing this game, like how the ghosts switch between a pursuit mode and a scatter mode on a set time scale, putting and easing pressure on players over a period of time, obviously the same isn’t going to apply here. It does, however give me the extra context to get better at this game, then eventually it might effect how I play the original. 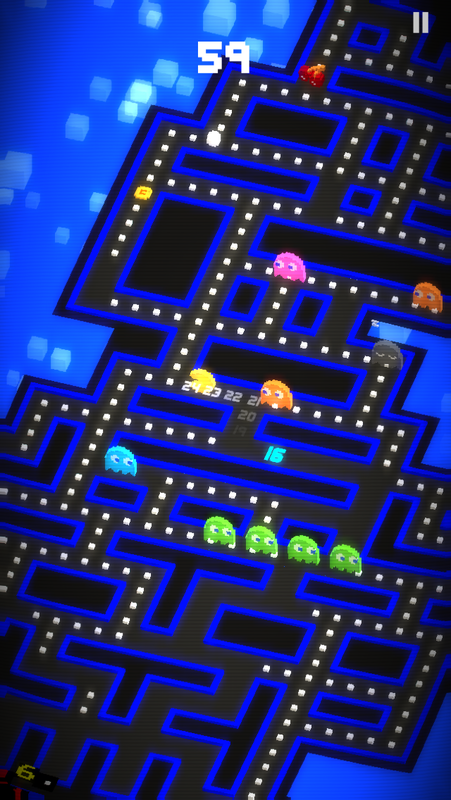 Enough about me though, Pac-Man 256 is on iOS now, and it’s free. So if anyone if remotely interested the game based on what I’ve written, I strongly recommend grabbing it and giving it a go, in fact get Crossy Road too while you’re at it. 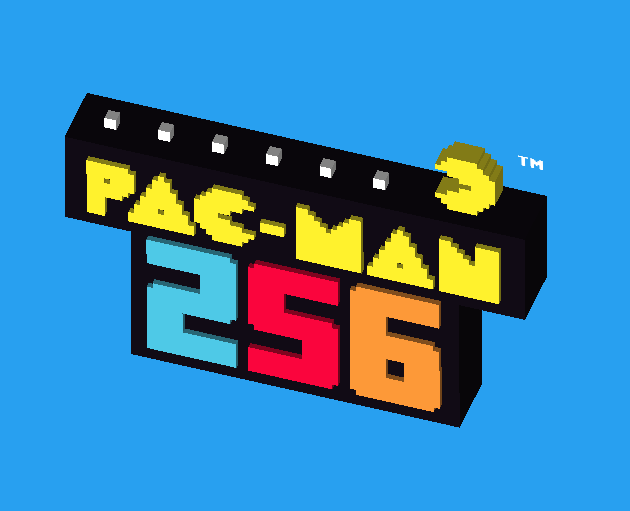 Posted on August 19, 2015 December 24, 2017 by WooderonPosted in My Thoughts on:, Video GamesTagged crossy road, hipster whale, ios, namco bandai, pac-man, pac-man 256.
loved reading this, I still love Pac-man and crossy roads is just funtastic!